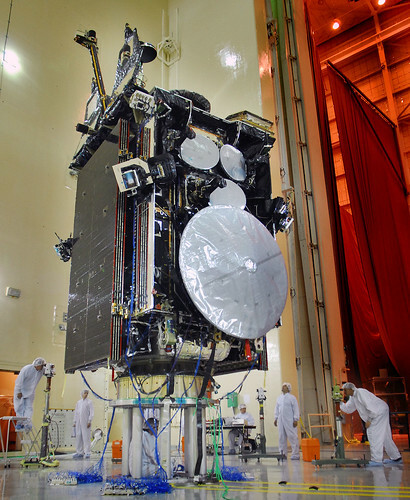 Satellites use in U.S. FCC’s broadband plan a big unknown. DirecTV may lose stations in fight over retransmission-consent fees. Alliant Techsystems and Lockheed partner to develop smaller less expensive launch vehicles for smaller satellites. The 50th Ariane 5 was rolled out March 25 for March 26 launch with a mixed civilian and military telecommunications satellite payload. ViaSat receives approximately $21.5 million order for Multifunctional Information Distribution System – Low Volume Terminals (MIDS-LVT) from the Space and Naval Warfare Systems Command (SPAWAR), MIDS Program Office (MPO). Comtech EF Data wins $2.5 million order for satellite communications equipment for new satellite network of an Asian Pacific enterprise. EchoStar Europe secures the ‘Best Hybrid Broadcast-IP Video Delivery Solution or Service’ award at the IPTV World Series Awards in London. Comtech AeroAstro is awarded $39.7 million contract to develop and deliver spacecraft bus to U.S. Navy for the Joint Milli-Arcsecond Pathfinder Survey mission. Eutelsat welcomes launch of UK Space Agency and government recognition of satellite broadband for bridgint the "Digital Divide." Secure World Foundation has released a budget analysis that examines an array of U.S. Department of Defense (DoD) space security programs as outlined in its Fiscal Year 2011 budget request. Measat-3a will distribute Discovery HD channel in Asia. KVH opens subsidiary based in Singapore to support growing demand for KVH’s miniVSAT satellite broadband and TracVision satellite TV services. Satcom Direct receives FAA certification for Inmarsat Satellite Communications Training Course to count toward requirements for Inspection Authorization renewal. European Union foreign ministers call on Iran to cease censorship and jamming of satellite broadcasts coming from Europe. KVH and Viasat receive authorization to operate the mini-VSAT service in the Indian Ocean region. Comtech EF Data receives $1 million order to provide C-band satellite communications equipment to a U.S. government agency. High-level panel of space leaders and economic experts will meet in Colorado Springs to address impact on the overall information infrastructure and financial climate as the space industry becomes more international and more diversified. Sea&Space Exploration, a Brussels-based consulting company, and Global VSAT Forum release report at Satellite 2010 stating that global consumber and enterprise demand for satellite communications has strong potential to exceed historical trends. Hughes Network Systems and Vizada reach agreement expanding Hughes Europe’s portfolio of managed network services for European enterprises. Air Force to add high-speed satellite communications link to Global Hawk UAV. Innovative Solutions & Support announce receipt of FAA Supplemental Type Certificate for the Class 3 Electronic Charts and XM Satellite Weather upgrade to cockpit system of Eclipse Aerospace EA500 Very Light Jet. Twentieth Century Fox and SmartJob sign non-exclusive agreement for satellite distribution of digital cinema content to theatres in Europe. Spacecom, Israeli operator of AMOS satellite fleet, is selected by Germany’s Da Vinci Media GmbH to distribut Da Vinci Learning Channel in Eastern and Central Europe. Canadian broadcaster’s get leverage under new framework laid out by the Canadian Radio-television and Telecommunications Commission to allow blockage of cable and satellite re-broadcast of local channels in absence of compensation. Comtech EF Data wins the World Teleport Association’s Teleport Technology of the Year award for its CDM-625 Advance Satellite Modem. ORBCOMM launches web-based subscriber portal at CTIA Wireless 2010. Satellite communications set up for Abu Dhabi motor rally. Sierra Wireless and ORBCOMM announce new M2M portal that gives ORBCOMM’s customers ability to seamlessly track and manage equipment worldwide, even over ocean. 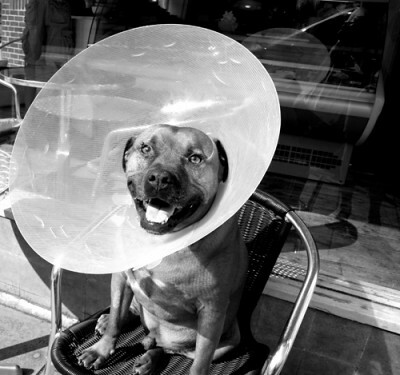 EchoStar plans Dish Network market expansions in North America. Surrey Satellite Technology welcomes British government program including launch of the UK’s first national space agency. SkyTerra stockholders approver merger with Harbinger Capital Partners. Thales Alenia Spaces negotiates with European Space Agency for contract to build Meteosat Third Generation satellites. Thrane & Thrane SwiftBroadband receives Inmarsat type approval and parts manufacturer approval from U.S. FAA. RapidEye enters reseller partnership with Harris. 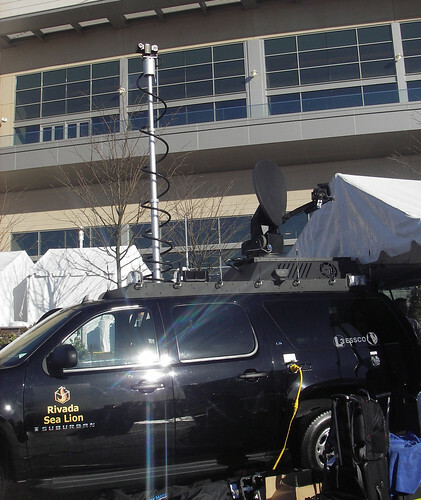 SatMAX announces record-breaking number of inquiries about its non-line of sight satellite equipment following second purchase order from U.S. Navy. 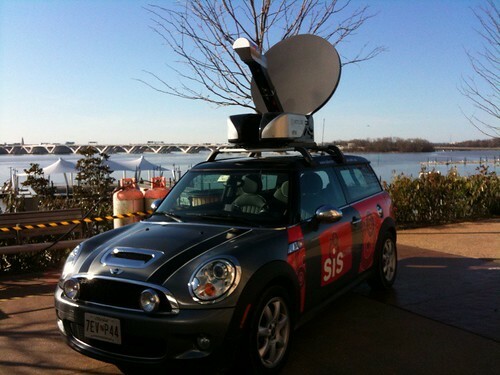 TerreStar to highlight satellite capability in standard mobile devices at CTIA Wireless 2010. Higher bandwidth availability and networking requirements in Military Satellite Communications (MilSatCom) create new opportunities for advanced electronic components. Eutelsat Communications has revealed it will be upgrading its satellite broadband service Tooway to offer download speeds of ‘up to’ 10Mbps by the end of 2010. Bankruptcy court approves second round of financing for Sea Launch. Intelsat signes agreement with Turkish operator Turksat to provide satellite capacity serving Middle East region. Eutelsat Communications announces the successful completion of the UK-built communications module for its high-speed broadband communications satellite, KA-SAT. London-based environmental campaigner travelling world in biofuel-driven bus runs into legal trouble in India for using a satellite phone in the country. Leaders from 5 largest MSS companies debate form and function of mobile satellite industry at Satellite 2010, and praise the U.S. FCC’s broadband plan. OverHorizon has selected Arianespaace to launch into orbit their OHO-1 satellite. A commercial Proton orbited the heaviest satellite ever to fly on the Russian launch vehicle March 21, placing the 6.3-metric-ton EchoStar XIV Ku-band satellite in its geosynchronous transfer orbit for the DISH Network. The launch vehicle’s Breeze M upper stage released the spacecraft after a nine-hour, 10-minute mission. Liftoff from Pad 39 at the Baikonur Cosmodrome in Kazakhstan came at 2:27 p.m. EDT. 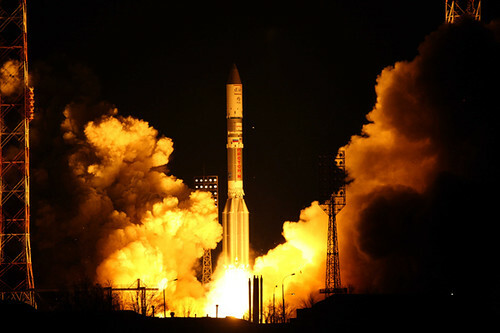 The launch was the second arranged this year by International Launch Services, and the fourth Proton launch of the year. The spacecraft was built by Space Systems/Loral based on its 1300 satellite bus. It will be positioned at 119 deg. W. Long., where it will deliver Ku-band service over the U.S. for the DISH Network’s high-definition programming. Time for a little vacation — in Sugarloaf, Maine. The weather may seem discouraging, but there’s no substitute for being here. Rain mixed with snow and sleet. The mountain’s completely open, with 130+ trails. 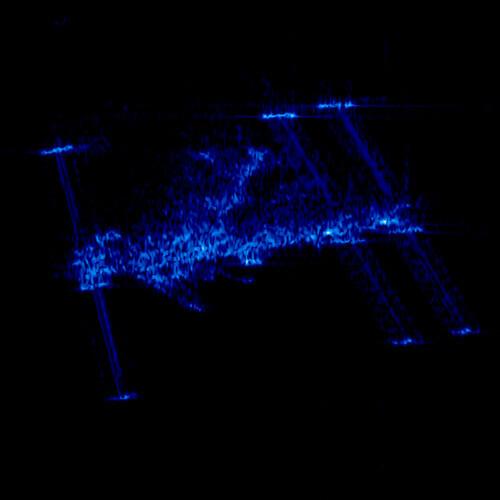 On March 13, 2008, the International Space Station (ISS) passed across the field of view of Germany’s remote sensing satellite, TerraSAR-X, at a distance of 195 kilometers. In contrast to optical cameras, radar does not "see" surfaces. Instead, it is much more sensitive to the edges and corners which bounce back the microwave signal it transmits. Unless they are directly facing the radar spacecraft, smooth surfaces such as those on the ISS solar and radiator panels, do not reflect a strong signal to the detector, so they appear dark. Yet the bright spots outlining edges and corners clearly show the shape of the ISS. The central element on the ISS, to which all the modules are docked, has a grid structure that presents a multiplicity of reflecting surfaces to the radar beam, making it readily identifiable. This image has a resolution of about one meter. The Air Force said it will request four years of funds totaling $6.5 billion for a Lockheed Martin Corp. military communications program that plans to launch its first satellite in September after six years of delays. The funding request for fiscal years 2012-2015 will follow $598 million sought for fiscal 2011, according to an e-mail from Gary Payton, the Air Force’s top civilian for space programs. The six-satellite program is budgeted at a total of $9.9 billion. The request, part of the Pentagon’s current five-year budget plan, reflects the Air Force moving forward with a program endorsed by Defense Secretary Robert Gates now that delays and technical problems have been worked out. Bethesda, Maryland-based Lockheed Martin and its top subcontractor, Los Angeles-based Northrop Grumman Corp., have been awarded contracts to build the first three satellites. They may get contracts for a fourth that the Air Force budgeted for next year and two more planned by 2014. 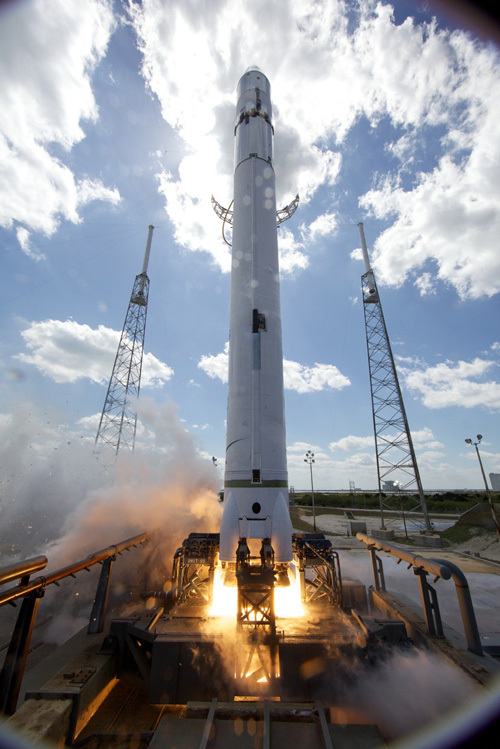 The Air Force budget figures show that the service may buy a seventh satellite starting in fiscal 2015. The Advanced EHF program calls for six satellites, capable of withstanding shocks from a nuclear attack, to allow secure communications between top commanders including the president. It also would provide transmission of tactical communications such as real-time video, battlefield maps and targeting data. Good day at the office for Lockheed Martin (and subcontractor Northrup Grumman). How "advanced" is this system? Dude. The B-2 is being upgraded, using fiber connections — inside the aircraft. A single AEHF spacecraft will provide more capacity than the entire Milstar system currently on-orbit — combined. The deal to buy Satmex is off. What seemed like a brilliant acquisition by all accounts, will not go through. EchoStar Corp. and MVS Comunicaciones SA ended their agreement to buy Satelites Mexicanos SA for $267 million after the Mexican satellite operator’s bondholders objected to the deal. Satmex, as the company is known, failed to get approval from holders of a majority of bonds within the 17 days allotted under the agreement, EchoStar said Tuesday in a U.S. regulatory filing. El Economista suggests they’re holding out for a minimum of $500 million. Not sure it’s such a good idea to wait. If Satmex-5 fails, how much would the company be worth then? I say cash out now while you still can. The Mexican government owns 20% of the company, so it would be interested to get their take on this. This Mini outfitted with a mobile antenna is pretty cool, although it may not be as practical as the "command vehicle" put together by CAMMS. CAMMS™ (Command Anywhere Media Management System) was developed to enable a totally secure, scalable mobile mesh (ad hoc) network and provide the necessary tools for Command Anywhere. The CAMMS™ mobile mesh software program is a patent pending Windows-based program, which provides the foundation for an ad hoc, self-forming / self-healing wireless mobile mesh network. It provides interoperability and allows real time communications with any others users in the mesh. Mobile mesh (ad hoc) networks offer many advantages over other types of communications networks. Chief among these is the ability of the mesh to function independently of a land-based infrastructure. 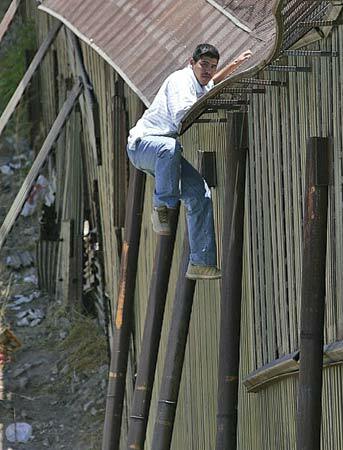 When communication is linked solely to a land-based infrastructure an acute vulnerability exists. By utilizing a mesh, the network infrastructure becomes decentralized, avoiding a central point of failure and control. Command can be located anywhere with hand off from first responder to others when required instantly. The CAMMS™ mobile mesh software does not require servers or fixed access points (FAP’s) and is compatible with existing mesh AP’s. The software may be purchased separately to maximize existing communications systems or as part of complete interoperable communications solution that includes software and AP. The FCC National Broadband Plan‘s release probably has nothing to do with the Satellite 2010 trade show at the Gaylord National Harbor Resort. Sure, satcom is referenced in the plan, especially chapter 4. More bandwidth. Lower price per MHz. Yeah, right. ZORAXION CITY, IMPERIAL HOMEWORLD—A laser pointer directed at the night sky by a young human in 1997 has finally reached the home planet of the Zoraxian race and is "annoying the hell out of everybody," sources on the alien planet reported Tuesday. "What is that irritating dot?" Zoraxian Emperor Fi’ar Shal Shoka communicated in a telepathic message delivered to the outer edges of the Throndastural Sands. "It’s pointed right at my facial genitalia. This is so embarrassing." At press time, irritated Zoraxian military personnel were hard at work building a giant megalaser designed to incinerate the source planet of the irritation. Let’s hope we get some laughs at the Satellite 2010 show in D.C. this week. Honestly, I’d rather be at SXSW. Sirius XM will be broadcasting some of it live.